After missing for more than eight years, Petunia, an American Staffordshire terrier, was found. She had disappeared from her home in Virginia sometime around Thanksgiving 2003. Last weekend, she was located in an animal shelter in California, more than 3,000 miles away. How do we know the dog is truly Petunia? She had been microchipped as a puppy, and a scan of her body linked her to a veterinary clinic in Virginia. The California shelter contacted the clinic, and the clinic got in touch with Petunia’s owners. I don’t think any of us would deny that without tracking devices such as microchips, we probably wouldn’t hear about remarkable stories like this—or be able to reconnect people with their long-lost pets. Domesticated animals depend on us for protection and sustenance, and tracking devices help us meet those responsibilities. 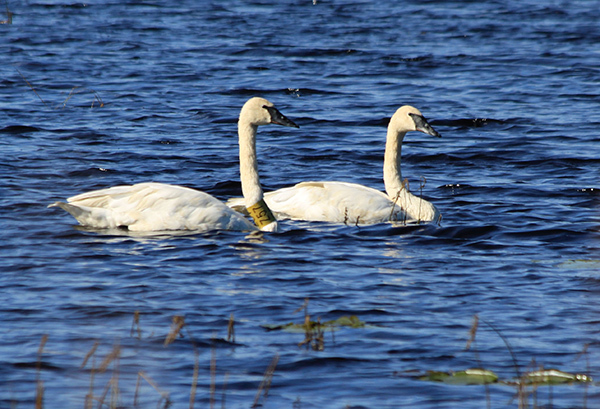 In the wild, of course, tracking devices on animals are used by scientists to gather data on migrations, find the home territories of various species or verify how far afield they roam. 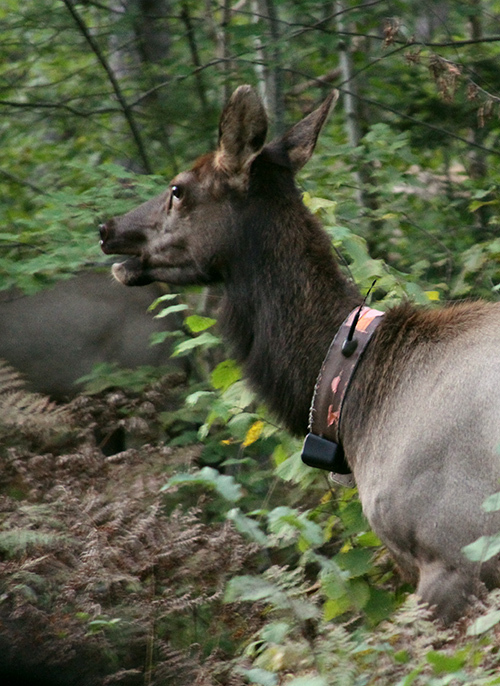 The devices range from tiny stickers on the wings of monarch butterflies to the large, heavy collars placed on elk. So we shouldn’t be surprised to learn that one of the Earth’s most elusive and secretive creatures—narwhals—are now being equipped with transmitters that will keep track of their movements by satellite. Surprised, no. But should we be concerned? Narwhals are often called the “unicorns of the sea” for the single, long tusk that erupts through their upper lips. Although a female will sometimes grow a small tusk, it is the male whose prominent “tooth” may measure more than eight feet. There are no more than 50,000 to 80,000 of these Arctic whales left in the world. More than two-thirds of the population summers in the fjords and inlets of northern Nunavut, Canada. Although the effort to track narwhals has been going on for decades, in August 2011 nine new narwhals were fitted with satellite tracking devices. But fitting these elusive cetaceans with the mechanisms was no easy task. For two weeks, researchers watched as the narwhals approached the nets they cast, only to end up avoiding them. Finally, with the help of local Inuit skilled in using harpoons, the mission was accomplished. The Inuit of northern Greenland, who design their kayaks to move with absolute silence in the water, hunt narwhals for food and have perfected the art of approaching them without being spotted. Once they had paddled into position, they flung their harpoons—whose spearheads were loaded with the satellite-tracking devices—into the whales’ flesh, embedding the devices in the narwhals’ blubber. Researchers say the narwhals felt no pain or were not harmed, since there are no nerve endings in this thick, fatty layer. Researchers also say that eventually all of the trackers will slowly be expelled by the animals’ immune systems. This means that the narwhals’ bodies will consider the devices an “attack,” and their immune systems will kick in, working overtime to eject the devices. It also means that some of their reserve energy won’t be available to fight off other, perhaps more pressing infirmities or diseases. I’m certainly not against tracking devices. I know that they have provided us with invaluable information on numerous species—data we probably couldn’t get by any other means. And having that knowledge often helps us to save these animals and their habitats from going extinct. Equipping our domestic animal friends, such as Petunia, with tracking devices may not be much of a health risk, since—typically—they live among us and we can easily monitor them. But it’s difficult to be sure with wildlife whether a sticker on a delicate wing can cause just enough drag to make a 3,000-mile migration no longer possible; whether a chunky, leather collar makes moving an antlered head just a fraction of a second slower when a predator lurks; or whether a small wound on a wet back from a harpooned-in tracking device will make an entrance for an environmental pollutant. I live in Texas as well. I used to volunteer as a quail tech at the Rolling Plains Quail Research Ranch near Roby, TX, (I worked with Dr. Dale Rollins). They think weather is certainly a factor – quail depend heavily on forbs in their diet – however, they think habitat fragmentation may be a greater threat. I think that they are leaning toward habitat as a greater predictor at this time. I will attach some links. Quail need fire regimes and I think re-introducing a “normal” pattern of fire behavior in Texas might be key. Debra: What part of the world are the bobwhite quail in decline? I’m located in Texas and have noticed in certain areas they don’t seem to be as plentiful. Do you believe this to be overall long term or cycle with the season,weather, and predator population? I have been working with African wildlife for the last decade and I am often appalled to see how wildlife tracking devices are misused. Elephants, lions, cheetah and wild dogs are fitted with gps collars on many game reserves under the umbrella of “research” but with little or no meaningful studies ever delivering results. In stead, these collars are used by game lodges and volunteer organizations to make money out of guests because it eases the process of finding these animals in the bush each day. I’m actually very interested in what the day to day activities of a Narwhal are. They benefit. I spotted a male brown pelican with a tag (accidentally when I photographed it with my telephoto lens) and reported his condition (he was very healthy). The tag has to be appropriately placed and by a professional. I have been working with these tracking devices for several years now and I can tell you that VERY strict protocols are in place for the proper placement of these devices and for the capture of the study animals. These devices are a tad more complex than the microchip device used in Petunia and the wildlife wearing the devices do not need to be taken in to the vet, (like Petunia), to confirm ID. I think the benefits of using these devices far outweigh the risks. For example, we are using special collars containing tiny radio transmitters to track bobwhite quail. Bobwhite quail populations have been in decline for several years now, and no one knows why. Thus, quail are lured into special one-way traps baited with grain and fitted with radio collars – each bird getting it’s own special frequency, (similar to a radio station in a car). The birds are released and they fly away unharmed, and apparently unaffected, by our work. These collars provide important information about landscape use by the birds which helps us make land management decisions that are beneficial to quail survival. I am certain that the scientists made the decision that fitting the narwhals with the devices would be similarly beneficial. 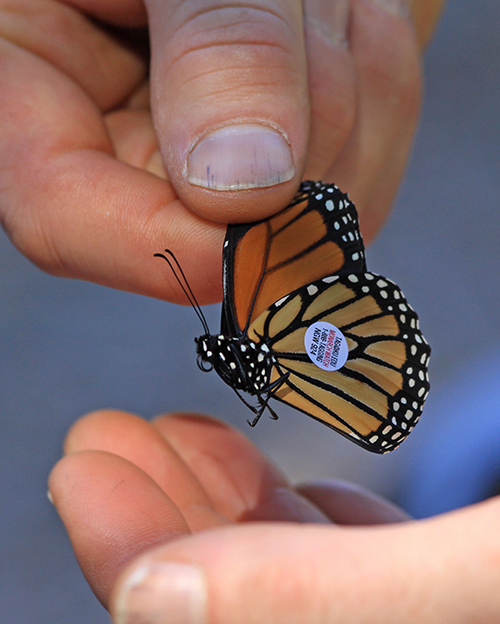 This technology continues to evolve, (as evidenced by the butterfly wing sticker), and will continue to improve, making use of this type of device an increasingly important tool in research and conservation efforts.